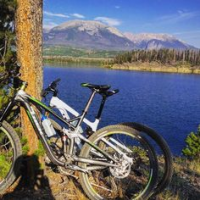 Christy Sports has the largest fleet of Trek Bikes in Summit County. It offers overnight tuning serivces, complimentary helmets (while supplies last), free trail maps, and a friendly staff with expert local knowledge. Featuring rentals, demos, retail, and repair. Adult and children's rentals include mountain bikes, bike path cruisers, and road bikes. Three convenient locations: Hwy 9 in Frisco next to 7-11, 213 N Main in Breckenridge, and 110 S Park Ave (Lone Star Sports).